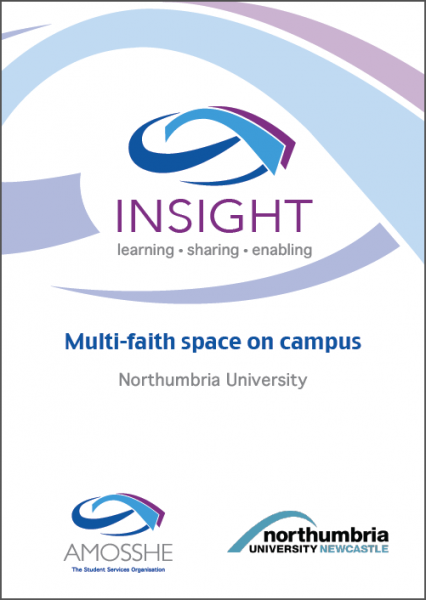 This project, undertaken by the Northumbria University, aims to investigate the feasibility of a more positive design and management of multi-faith and contemplative space. Principal investigator: Simon Lee, Student Support Manager (Policy, Projects and Inclusion). Total award from AMOSSHE: £3,200. Provisions for the expression and observance of religion and belief in UK universities are protected by law. Article 9 of the European Convention on Human Rights is enshrined in UK law by the Human Rights Act 1998, which provides a right to freedom of thought, conscience and religion, and the Equality Act 2010, which sets out a range of specified “protected characteristics” upon which it is illegal to discriminate - one being religion and belief. While there is no specific explicit statutory requirement placed on higher education providers to provide facilities for personal reflection, meditation and prayer (indeed there is no legal requirement for universities to provide any social or cultural facilities other than education) most, if not all bodies across the sector have engaged actively with faith throughout their histories and many provide a range of physical facilities for prayer and contemplation. A desk-based research exercise carried out recently at Northumbria University to support the development of the faith and contemplative space, has suggested that while chaplaincy and faith provision exists in some form at the majority, if not all, UK higher education providers, this provision and its associated physical space is an evolution of what has existed historically, and changes and developments tend to be responsive rather than proactive, usually to support an ever-changing student body. However, while chaplaincies have evolved for the better, to become more inclusive and diverse, arguably physical facilities to support their activities have evolved in a less positive manner. Where physical space is identified for faith or secular contemplative activities (whether this is an adaptation of a previously otherwise occupied building or, where funding allows, the development of a new facility) there still seems to be both a clear separation between different religions or secular groups using the space, and limited use of the space for interfaith dialogue and scholarly pursuit. Two contrasting ways of sharing space have been identified by previous studies, categorised as positive and negative. Positive ways of sharing the spaces have images and artefacts from different faiths on open view and woven into the fabric of the space. This leads to a feeling of unity by inclusion. In the alternative, the negative type, images and iconography from different religions are either absent or kept separate and this can lead to unity, but “unity by exclusion”. It is worth noting at this point that “positive” and “negative” relate to the style and conventions adopted in the management of the faith space: no judgement on either approach is implied or should be inferred from the use of these terms. In a survey of over 100 multi-faith rooms, the primary architectural features were found to be flat, white, plasterboard walls and low suspended ceilings. Only one in ten had any natural light, and any furniture tended to be of the cheap flat-pack type, primarily because of its neutrality. This negatively managed type of multi-faith space is often associated with a lack of permanent chaplaincy, and the hiding of religious iconography either its packing away in plastic storage boxes following use or its being hidden using clunky mechanical mechanisms such as curtains and screens. This creates a space that can be empty, somewhat cold and not one that has a feeling of shared ownership, dialogue, warmth and the development of positive relations or scholarly pursuit. “People of some faiths cannot pray in a room where imagery signs or icons or written materials from other religions are displayed. Therefore it is not permitted to permanently display imagery, statues or written materials in the multi-faith and quiet contemplation room, or just outside the room. This is in no way an attempt to single out St. George’s: guidelines for multi-faith spaces across the sector are likely to be very similar across institutions. However, this case does highlight neatly the operational manifestation of the negative management of faith space and the creation of a space that is both everyone’s and no-one’s, with any slight transgression referred immediately to an overseeing committee. It is understandable that the negative management of space has been the preferred option across the sector and beyond, partly as a response to a lack of comfort with the diversity agenda, partly from a genuinely held and laudable desire not to cause offence, and also partly due to the lack of practical guidance around a different, more positive approach. Most guidance available for the sector and beyond is limited to a discussion of legislation, and consideration of religious differences, with any actual instruction limited to stock advice such as “ensure neutrality of space and consult with users of the facility”. This project will consider this under-researched element of faith and diversity with a view to producing comprehensive and practical guidance for use across the sector. It will aim to investigate in detail the difficult questions of faith in this context, such as the issues of iconography, the use of shared space, praying together and how to make people of all faiths (and none) feel that the space is genuinely open and available to them without resorting to the negative management approach. Facilitate good campus relationships and improve the student experience. Enable effective risk management – for example identification of warning signs relating to radicalisation or extremism. The project has the following aim: to investigate the positive design and management of multi-faith spaces, its feasibility, and make good practice recommendations for the sector. To investigate, through a series of focus groups, the religious, secular and practical arguments that have been forwarded in support of the negative management of faith and contemplative space and identify what options are available for an alternative approach. To investigate how the architecture, design and management of faith space can help facilitate good campus relations and improve the student experience and promote genuine interfaith dialogue. Produce practical best practice guidelines for the sector that gives suggestions on the design and management of multi-faith space, which colleagues can use as a framework for discussion in their own institution. The project will follow tried and tested research methodologies for a small research project. The research will be led by a project team of Northumbria University staff comprising the Student Support Manager (Policy, Projects and Inclusion) as project lead, with specialist advice from the Head of Student Support and Wellbeing and our Coordinating Chaplain. This small team will develop a project brief that will outline the two key strands to the research. The first will involve desk research into the design and architecture of multi-faith space with a view to identifying whether more positive and inclusive approaches are architecturally possible and what they might look like. A specialist researcher will be appointed either from Northumbria’s own highly regarded Architecture and Built Environment Department or from an external specialist. The second strand of research will be led by Northumbria’s Student Support and Wellbeing service, specifically the Chaplaincy and Policy, Projects and Inclusion Team who lead the university’s approach to student diversity, and are supported by Northumbria Students’ Union. This strand of research will employ research methods including focus groups, questionnaires and interviews with representatives from key religious groups locally, community representatives as appropriate and the wider student body. These will be used to analyse and test some of the arguments put forward in favour of the negative management of faith space and also explore the feasibility of the positive management of faith and contemplative space through a variety of theoretical and practical lenses. Both strands of research will benefit from access to previous work carried out at Northumbria, including student-led research by Northumbria Students' Union, and legal briefings that have been used in internal projects to develop the university's own faith space offer, which will be made available to the researchers to add context and content to their work. Also, a range of analysis software including SPSS and the NVIVO 10 system (which specialises in the analysis of qualitative research) will be made available to the research teams. Building on these two research strands, the project team will produce a series of guidelines on the effective and inclusive (positive) management of faith space. These guidelines will be applicable across the sector and will recognise that different universities face different challenges in terms of their faith space provision, diversity of staff and student bodies and the resources they have available to consider faith and contemplative space. The guidelines will differ from what is already available in that they will be sector specific, practical and detailed, while avoiding vague advice and unnecessary or repetitive content. A published set of best practice guidelines, applicable across the sector, for the positive practical and inclusive management of multi-faith, contemplative spaces. At least two conference presentations, as well as All Change, the AMOSSHE summer conference 2015. Potential for coverage in relevant sector press (including amongst others the Times Higher Education) promoting the findings and AMOSSHE’s support of the project. Potential submission of the research and its findings to a relevant scholarly journal. An article / case study will be written up and presented to relevant publications across the sector that specialise in faith provision, building management and suchlike. A scholarly article for relevant publication will also be investigated. A report / case study will be presented at relevant national conferences considering faith on campus. Approaches will be made to organisations that might have an interest outside the narrow scope of University Chaplaincy, including partners in the wider public and private sectors locally. Regional distribution to other northern region universities will take place through key local networks, such as AMOSSHE regional groups, the North East Universities Equality and Diversity Group, the North East Regional Prevent Group and regular dialogue with partners across Newcastle and the North East. Internal dissemination across Northumbria will take place via university committees and key staff and student publications. Other organisations such as the Equality Challenge Unit may be willing to assist with dissemination across the sector.